On the fourth of July in 2015, I had a conversation with Dr. Bira in which he expressed a wish that I might do my best to popularize Tenggerissm. His wish directly correlated to my own private intention and so I was emboldened to begin a process that continues to evolve along three interwoven lines: historical research, analysis of the present and an imaginative line that extends into the future. The third should not be understood as speculation or prediction, which are passive modalities of limited value. It rather proceeds from the notion that the future is formed firstly in the imaginative realm, and so care and attention must attend this formative process. Chingiss Khaan summarized thus: “I receive my inspiration from Father Sky, but it is through Mother Earth that I am able to turn my inspiration into reality.” Chingiss Khaan sought inspiration as a matter of great practical necessity, especially as each successive phase in his leadership produced unprecedented challenges. It was his Tenggerist outlook that gave coherence to his efforts, harmonizing often radical ideas with all available human and natural resources. Inherent also in this Tenggerist perspective is the spirit of gratitude, which all people of faith and wisdom regard as the foundation of prosperity. We see in Tenggerism an elegant, multi-dimensional conceptualization of life which remains as whole, distinct and unblemished today as it was in its primodial inception. We see, moreover, a conceptualization which agrees with our modern aspirational notions of Development. It is in this regard that the task of popularizing Tenggerism takes on, for this writer, great immediacy. The symbolic representation of Tenggerism–three circles in triadic symmetry–expresses the balanced relationship between Father Sky’s inspirational energies, Mother Earth’s material blessings and Human initiative. For this writer, this symbol represents the infinite, unbounded nature of creative potential, constituting a promise whose ongoing fulfillment depends upon universal laws of harmony. It is, I believe, no coincidence that the same symbol appears on the banner of the Roerich Pact. The Pact’s principle advocate, President Franklin D. Roosevelt, was also one of the modern age’s most forward-thinking proponents of Development. Roosevelt’s vision of a world uplifted by the spirit of Development remains Humankind’s best hope. It is my hope that my efforts to popularize Tenggerism might contribute something to the actualization of Roosevelt’s vision. Peace through Development. Development through Culture. Pax Cultura. At present, we at the Roerich-Bira Foundation feel charged with a sense of immediacy. The world is gripped in a roiling conflict of great complexity. It is different from the great conflicts of the 20th century in that most of it is happening under the surface and yet its ramifications feel even more all-encompassing and our future feels even more crucially at stake than in earlier times. The Foundation feels it wise to be as optimistic as humanly possible. Yet we recognize the urgent need to contribute to a positive outcome to the fullest extent of our potential–which, while only newly tested, seems considerable. The sense of urgency that animates our thoughts and actions is balanced by a recognition that a thoughtful, well-considered agenda is best. Indeed, these times demand an ingenious blend of timely action and time-tested wisdom. However great the chaos and however dark appear the prospects of failure, we believe in embracing a spirit of harmony and celebration. We believe this is the wisest course and the one most likely to produce the most effective action and to inspire the most cooperation. The spirit of innovation is the spirit that solves the thorniest problems. And this spirit is fed and is regenerated in the cultural realm. We at the Roerich-Bira Foundation believe that culture should be celebrated actively, with an urgent yet self-confident attitude. We believe to our core that an active, engaged and solution-oriented celebration of culture will stoke the engine of development. It is the spirit of innovation and development that constitutes Humankind’s connection to the highest version of our collective identity. Through culture, we are enabled to imagine and actually connect with the highest principles of the Universe. Through culture, we connect with the means to actualize the highest version of ourselves. The vision, the means and the will which bring about the total development of the human being are gifted to us through culture. Just as the individual is inevitably brought to a closer approximation of his/her higher self through access to a higher vibrational understanding of life, so the collective–the entire species and even all sentient life–can be raised above the lower vibrational energies of ignorance and fear through the modes of culture. These assertions are based on science. It has long been understood that we attract not what we fear we lack, but we attract a reality that mirrors our vibrational state. Many individuals have employed this understanding to uplift themselves, to create prosperity and abundance for themselves and for those around them. It is said that the great ones among us–and certainly Nicholas Roerich and Dr. Shagdaryn Bira must be considered in this light–create hope and abundance through a special connection to the higher energies that flow to and through each of us. These energies are available to all–and this should be the message that the rest of us must do our best to receive to the fullest possible extent. We benefit most directly from the dynamic attainments of our cultural, spiritual and scientific achievers when we recognize that the the power to uplift lies within each of us. I can personally attest that this has been the direct effect of Dr. Bira on my life. No doubt, Dr. Bira will express himself similarly in regard to George Roerich and the legacy of Nicholas Roerich himself. It is our contention that the spiritual significance of the Roerich Pact is cause for celebration. It is in celebration that our imaginations are engaged and our actions become ceremonial, expansive and inspired. It is in genuine celebration that we connect to one another via the higher vibrations. In true celebration, the willingness to commit ourselves fully to the art of living is invigorated. The art of living is the essence of development in all its forms. And so we should celebrate in a manner that attunes us to the higher frequencies along which flow the currents of innovation and creativity. All the best sources of wisdom admonish us to do so. And the spiritual significance that Roosevelt intuited is nothing other than Universal Love, through which we find the energy and capability to overcome any obstacle. Of creativity, Nicholas Roerich wrote: “The language of creativity is that pan-human tongue understood by the heart.” He goes on to state unequivocally that “Culture is the Heart.” It is culture that is spoken from the heart and addressed to the hearts of others. The great ones among us are imbued with the spirit of sacrifice and this is indicative their great achievements. While the intellect may manifest the divine, it is the Heart that engages in sacrifice for the greater good. The sacrificial labors of the great ones are the riches of culture–the indispensable riches that comprise a sort of evolutionary fund that gives hope and opens new possibilities for each generation. Nothing could be more urgent than the need to create new sources of prosperity in every sense of the word. We encourage a development that proceeds unencumbered by the restrictions and limitations imposed by the very few who–through ignorance, greed or vanity–seek their own aggrandizement at the expense of the entire race. We seek to dispel the darkness of want and crooked intentions. And so our celebration must be followed by concerted effort. Our discourse here today, illuminated by the Light of Culture, will encourage and inform such laudable efforts as were envisioned by Nicholas Roerich when he announced the beginning of the Epoch of the Heart. His sacrifice and contribution, distilled in the Roerich Pact, invite us to deepen and broaden our efforts to cultivate and uplift not only the Human Spirit but the Human Being in the flesh. For it was Gandhi who observed that poverty is the worst form of violence. On September 20th of this year, I had the very good fortune to attend the International Day of Peace celebration at the Roerich Museum in New York City. Disciples of Peace from all over the world were in attendance. An unspoken consensus that evening affirmed that the Roerich Museum was the best possible place for the United Nations to hold such a gathering. Roerich’s most iconic images glowed on the walls around us. His energy and spiritual aptitude drew us to this location as if by some irresistible cosmic inducement. After the powerful statements and personal testimonies that were shared, I was indescribably pleased to be approached by many people who were curious about our work here in Ulaanbaatar. They expressed the desire to come to Mongolia, to witness and participate in our research, our actions and our spirit. I encouraged all to come. Never before had been in such an ideal position to promote our Foundation or the principles we espouse: economic fairness, respect for our natural environment and non-aggression. We believe that these principles, held sacrosanct, will serve the cause of development and that the vision of Pax Cultura serves as our guiding light. But what I wished to emphasize to all those who approached me was that the exceptional nature of their Mongolian colleagues lies in the ability to take action–and to do so, innovatively and persistently, until results are attained and the next level of evolution is clearly revealed for future generations. Mongolians are doers, I told them. Please come to Mongolia to witness, contribute and find inspiration. Quite a number of people assured me that they would! The great issues of our time are transnational issues: economics, environment and law. We believe that these issues require the action and reflection which the Roerich Pact dares us to consider. And we affirm the power of culture both to connect us to the vision of an ideal human society and to provide us with the communicative, educational and scientific means to turn the vision into results. Thank you all for attending this afternoon’s celebration. May our discourse be animated by the joy both of collaboration and of the fulfillment of purpose. 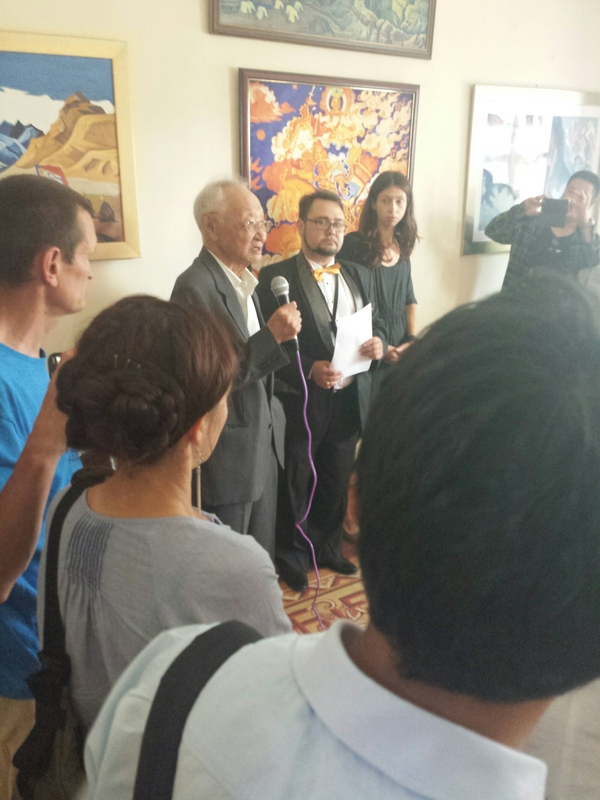 The event held at Ulaanbaatar’s Roerich Museum on 4 July 2015 was a remarkable success. We at the Roerich-Bira Foundation were surprised at the wonderful turnout and the attention this event received. Most remarkable was the energy and enthusiasm. Everyone was excited to be there and it was quite obvious that there would be much support for the future of the Foundation and for our agenda. Our colleagues from St. Petersburg drove all the way to Ulaanbaatar, traveling the difficult terrain and visiting the remote locations that were experienced by the Roerichs many decades ago. Aleksei Bonderenko brought his daughter Lena and a team of committed and brilliant culture warriors in a pair of new UAZ vehicles emblazoned with the Roerich logo. The “jeeps” were splattered with mud and we stood around them for some time in the hot afternoon sun admiring them, imagining their long journey and listening to accounts of the long trek. Aleksei’s spirit and his manner infused our event with optimism and goodwill. The Roerich Society is fortunate to have such a natural leader in St. Petersburg. Their arrival validated our sense at the Foundation that our recent activities–i.e. the stupa restoration, our tree planting, our television interview with Khishigsuren, our writing and research–had increased the magnetism of the museum. Only the week before, we had received colleagues from Siberia and Yaroslavl. Their warmth, engaging conversation and passion for truth and culture had also substantiated this sense that our work and mission at the Museum is indeed gaining momentum. The light and joyous spirit that hovers in and around our Museum seems to be growing brighter and that good fortune is attracted by this! The St. Petersburg team had arrived two days before our event and we spent several hours in the Shambhala room of the museum sharing tea, coffee and cakes and engaging in lively conversation. In particular, I shared with Lena my news from New York, specifically the 80th Anniversary of the Roerich Pact exhibition at the United Nations. I told her that while it was an honor to be an American representing Mongolia, I couldn’t fail to notice that very few Americans were in attendance. Lena and I talked about the dangerous state of global affairs that is now tragically marked by senseless conflict, orchestrated by the powerful few, in which the innocent lose their lives, their livelihoods and homes. We agreed that the need to affirm and defend the realm of human culture is more urgent than ever. On the 4th, I arrived at the Museum a half hour before our big event. Preparations were underway in a congenial spirit of excited anticipation. A small team of local young men who have only recently started a coffee roasting business arrived and began setting up a coffee station. One of them, also an accomplished traditional Mongolian musician, filled the Shambhala room as the guests began arriving with the rich and haunting sound of his morin hoor, which is the Mongolian equivalent (and probably predecessor) of the European cello. I took refuge in what was once Nicholas Roerich’s study in order to gather my thoughts for my speech. In the cool, dark study, several Foundation participants were collating the gifts to be given out to our guests: beautifully reproduced sutras provided in several languages that were placed in envelopes decorated with the image of its famous author, the lama Zanabazar. The sutra (1696) is entitled “Jinlavchogtsol” and is a passionate call for peace between the east and the west of Mongolia. It would be difficult to conceive of a more fitting present for our guests. The Foundation recognizes the existential imperative of restoring sanity to relations between persons and peoples, and of finding common ground through cultural awareness. We consider it our mission to facilitate the easing of tensions, promote development and the general uplifting of all human beings. More accurately, we find that we share the intuitive drive to promote understanding at the heart level. The event got underway at about 3:30. We felt most fortunate and grateful that so many of those we invited were indeed able to attend. Officials from the Russian and Belarusian Embassies; Mongolia’s first president P. Ochirbat; officials from the Mongolian Ministry of Culture, Education and Science; our friends from the Russia Fund; Mogi Badral, the CEO of the new media outlet “Cover Mongolia”, as well as Novosti Mongolia television . . . I am afraid it is not possible now to list the names and positions of all our guests! Suffice it to say that we at the Foundation remarked to one another many times how incredible it was that we were able to assemble such an exciting group on such short notice. Certainly the reputation of our founder Dr. Shagdaryn Bira could account for such a turn-out. The devotion he inspires here in Mongolia is profound. He is seen, rightfully, as a national father figure–the historian and Mongolist responsible for keeping alive the flame of Mongolian culture through times of nearly overwhelming challenges. When he was introduced to speak, the room became deeply attentive and focused with love and admiration. Dr. Bira spoke eloquently about the ongoing journey that is Mongolia, about Tenggerism and the legacy of Genghis Khan and the promise of tomorrow. In my speech, which followed his, I welcomed our guests, remarked on the extraordinary good fortune of our Foundation in having such a successful inaugural event and called Dr. Bira, “the father of the Mongolian renaissance.” The concept and actuality of this renaissance is the basis for our work at the Foundation. The very real reinvigoration of spirit that will be directed toward substantive and evolutionary projects indeed owes its power to the flame that Dr. Bira has kept alive for many decades through his visionary scholarship and personal dignity. After the speeches in the Shambhala room, we adjourned to our “music room” for some wonderful Russian music. Our colleague from Ukraine, saxophonist Dima Tagan, kept us enthralled with his sonorous renditions. We were also very lucky to have the very wonderful Russian singer Vlada who sang with taste, passion and depth. Also, the very great Russian guitar virtuoso Alexander Saga played for us with astonishing power and enormous technical command. It was my great privilege to be accompanied by him when I sang three Russian “war songs” during which nearly the entire room sang along. The conversations continued for several hours after our music. The feeling was celebratory and earnest. Pledges of further support, ideas for collaboration and partnerships, and friendships were created. Our little museum was buzzing with possibilities and potential. And today we are still quite amazed at the success of our first event. Formally, the event was intended to commemorate the 80th anniversary of the Roerich Pact. But we at the Foundation are very forward thinking people and very independent minded. We believe that the best way to honor the Pact is to imagine and pursue its enhancement, to enlarge its mandate and to deepen the general understanding of its spirit and purpose. And so our celebration was more forward-looking than commemorative. In 1935, President Franklin D. Roosevelt wrote of the Roerich Pact: “This treaty possesses a spiritual significance far deeper than the text of the instrument itself.” It is the spirit, then, of the Pact that calls us to action. This spirit is commensurate with the very spirit of Culture, that pan-human phenomenon to which Roerich devoted his life energies. His work was, by its nature, transformative. It sought to bring to the attention of a brutal and wayward human species the necessity of protecting and advancing its cultural accomplishments. His efforts in the promotion of culture were distinctly evolutionary in their intentions. The transformation he sought, and we continue to seek, involves reconnecting the human race with Heart. We must understand that it is a deficiency of Heart that permits the “inhuman”: the killing and exploitation of our fellows, the careless or deliberate endangerment of future generations, and the wanton destruction of our natural world. I think we must agree that the only persons who might defend such heartless behavior as listed above are those complicit in their commission, directly or passively. It is furthermore clear that we are facing such a degree of heartlessness that the future of humanity is indeed threatened. And so a reconnection to the human heart is the only antidote to the progressive decline of humanity. To those who may say that all good things must come to an end and that the demise of humanity may be a merciful and even natural outcome, we urge a closer look at what this decline would probably be like. Is it likely to resemble a gentle, “benevolent” euthanasia? Or is it not more likely to produce horrors upon horrors, each one prone to escalation, visiting increasingly intolerable cruelties upon the innocent. Having pondered this question realistically, are we prepared to accept “inevitable decline”? This evolution leads us naturally and of necessity to an Epoch of the Heart, when the Heart must play the dominant role in collective cognition which will result in an expansion of consciousness. To paraphrase Einstein: “It is impossible to solve a problem while remaining at the same level at which the problem was created.” Roerich’s prescient and visionary rallying cry of the Heart is nothing other than a corroboration of Einstein’s axiomatic observation. The problems that now confront the planet are indeed amenable to the moderating effects of culture precisely because these problems are the pernicious outgrowths of brutality and the addiction to methodology. The existential problems have arisen from a lack of heart and must be addressed from the level of culture. The role of culture in human life is a vital determinant in the ways we view and relate to one another as well the ways we evaluate ourselves and our own actions. 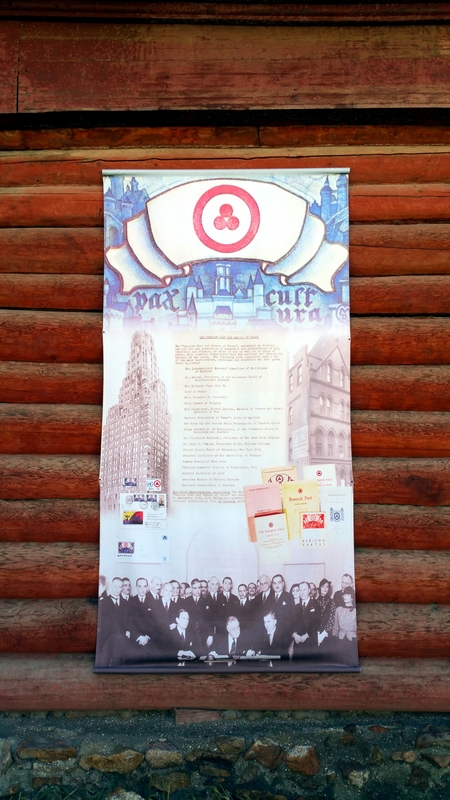 Culture conveys its wisdom in the “pan-human tongue” of creativity which is “understood by the heart.” The position of the Roerich-Bira Foundation is that the great transnational issues of our time require a heart-based discourse in the pan-human tongue of culture and creativity. When the Roerich Pact came into effect in 1935, it offered an historically unprecedented degree of protection to culture. Culture was to be protected from destruction during armed conflict, neglect in times of peace as well as from any and all dangers. The dangers facing culture today include, most tragically, its diminishment. What is considered culture in the still prevailing yet faltering paradigm emanating from the West tends to be limited to commercial spectacles, museums, grant art and the occasional archeological find. There seems to be a programmatic effort to remove the more all-encompassing issues entirely from the “purview” of culture. These issues have been commended to the heartless and destructive machinations of technocracy. The Roerich-Bira Foundation has identified these issues as: economic, environmental and legal. We maintain that these issues are best considered with the heart-based wisdom of creativity and culture. Indeed, the very cognitive soil from which springs our ability to conceptualize best practices related to these crucial categories is the very same fertile ground we call Culture. Economics, properly understood, reflects nothing other than a social contract that is conditioned by the pan-human experience of culture. Our understanding and operative relationship with our natural environment is similarly a product of cultural development. Likewise, our notions of law and peace find their sources in deep cultural repositories of reflection and experience. In each of these existential significant categories, we have seen the heartless erosion of basic human values commensurate with the diminishment of culture and the accession of technocracy. So it seems that the danger facing culture today is not “merely” the destruction of artifacts or the corrosive neglect by a consumerism that increasingly serves the interests of the very few, but the hollowing out of its basic significance with respect to the transnational issues that threaten to undermine completely the future of the species. The wisdom of culture, as elaborated in the pan-human tongue of creativity, must be reintroduced to the presently impoverished discourse surrounding the most important issues of our time. The wisdom of the heart will certainly restore empathy to matters of economic development, sensitivity and ingenuity to matters of environmental balance, and a vibrant commitment to higher justice with regard to legal systems. And so the Roerich-Bira Foundation proclaims its mission as one that restores culture and heart-based wisdom to its rightful place as the primary evolutionary driver in the most crucial issues faced by the human society. To this end and in this spirit, we propose a conference to be held in November that will address the fundamental need to reformulate the human approach to transnational concerns of existential significance. The program will emphasize the constructive power of Culture to address these concerns. Our Foundation posits three pillars of evolutionary development: economic fairness, environmental respect and non-aggression. “Non-aggression” relates directly to the development of law–especially as it regulates the relations within and between societies–and functions as a basic directive and tenet of peace and stability. These three pillars are, in fact, wound around one another, inseparable, forming a durable free-standing structure. Evolutionary development depends on each to an equal degree. Recent history provides us with a catalogue of instances which prove the inter-relatedness of these three pillars. We are unafraid to address them as a unity of concerns and to maintain that a heart-based approach to human society will do so as well. Today, we can witness the emergence of alternatives to the degradation and deprivation associated with technocracy. A case in point: we were very pleased to receive representatives of the Belarusian Embassy. Recently, Belarus has instituted fundamental economic adjustments that have already begun to redirect economic benefits away from the international banking cartel and toward the average citizen. Russia and China are forging new economic ties that will invigorate genuine broad-based development. We, as Mongolians, cannot fail to notice our geographical and geopolitical centrality to the emerging Silk Road community and, as cultural internationalists, we regard as self-evident that our region will drive tomorrow’s world economy. Also, we, as Mongolians, naturally desire to be at the vanguard of environmental understanding–due in part to the perils we presently face as well as to our cultural legacy of environmental respect. With regard to law and peace, we recognize that present conduct in the realm of human relations has degenerated to abysmal lows in terms of what is acceptable what may be expected. We feel a desire to offer a forum wherein heart-based solutions may be explored. Again, we feel that Mongolia is uniquely endowed to provide such a forum and that our mission obligates us to facilitate creative discourse on the subject of law and peace. In short, we propose to assemble a panel of the very best thinkers and doers we can find who share our vision of Roerich’s “Epoch of the Heart”. We intend that our conference should generate constructive speculation, new research as well as projects which address in a creative manner the existential issues of our time. We regard the “expansion” of the spirit of the Roerich Pact to be the natural result of its evolutionary essence and we expect many wonderful results. Indeed, if our event on 4 July can provide any indication of the efficacy of our mission, we feel confident in holding such expectations. At the UN Roerich 80th anniversary exhibit in April, I was approached by a very intellectually accomplished and interesting man who introduced himself as a Freemason, who somehow knew who I was. He asked me what I knew about the Roerich Pact symbol. My Bulgarian colleague who was standing next to me offered her expertise and told him that the circles indicate Religion, Science and Art. She then offered an alternative interpretation: that the circles represent Past, Present and Future. I, then, introduced them both to an interpretation that is apparently understood almost exclusively in the pan-Mongolian world, an interpretation that was introduced and impressed upon me by Dr. Bira: the three circles, which Roerich first saw in Mongolia inscribed on stones in ancient times, represent the essential concept of Tenggerism–a triad of Heaven, Earth and Humankind held in cosmic balance. Neither my colleague nor this Freemason had ever heard of this interpretation and both seemed surprised. After a conversation of perhaps an hour during which time our Freemasonic friend attempted to interest me in his Order, I made a “counter offer” and did my best to induce him to come to Ulaanbaatar to join our cause. He indicated a genuine interest, although I have heard nothing from him since then. I continue to hope, however, that he will clearly apprehend that the Freemasonic agenda has reached a dead-end and that its traditional western territories are now rife with fear and despair and seem poised on the brink of chaotic demolition. Having lived half my life in Freemasonic territory, I can attest to the liberating clarity that the Tenggerist triadic concept can bring. Reading the works of Dr. Bira, one discovers that Tenggerism brought peace and stability to the world’s most successful international order: the Mongolian Empire. Contemplation of the Tenggerist triad eases the mind and attunes one to cosmic harmony. Beholding this elegant symbol, one can only marvel at the power of culture to moderate and dignify the human experience. One can only feel profound gratitude to the ancient visionaries who apprehended cosmic truth and who formally encoded their discoveries in the symbols, artifacts, texts and monuments which we may now behold. We must exert ourselves to bring this ancient cultural wisdom to bear on all current issues of great seriousness. To do so requires ingenuity, energy and collaboration. Our proposed November conference is calculated to augment all three of these. What will be central to our exertions will be, of course, the Heart. Many thanks for you attention and cooperation in this matter. So much has happened since last I wrote. Most recently, a very well-respected television journalist in Mongolia came to the Roerich Museum & Shambhala Center here in Ulaanbaatar and interviewed our founder, the world’s preeminent Mongolist Dr. Shagdaryn Bira. Khishigsuren Sharkhuu is the general director of Enlightenment TV, which is widely watched and includes in its fan base all of Mongolia’s intelligentsia as well as all former presidents and prime ministers. “Soyongegeeruulegh” means enlightenment in Mongolian and it was indeed an honor and, I believe, a very positive omen to be covered by such an outlet. And Khishigsuren is an extraordinarily capable and insightful interviewer, determined to wring from her subjects the most meaning, relevance and depth of content. She interviewed Dr. Bira for nearly two hours and it was wonderful to see the interview gather energy and clarity. Truly, she managed to convey to her respected audience a remarkably articulated and inspiring vision of Tenggerism, Shambhala and the Roerich legacy. For us at the Roerich-Bira Foundation, the interview was a kind of cosmic gift. It not only gave us the publicity we have very much needed, but it did so in an ideal fashion and we are very grateful. I was also interviewed and spoke on camera for perhaps ten minutes. My message was relatively simple: Shambhala is created by the attentiveness and good will of persons who care for one another and for our earth, sky and cosmos. It is not a mystery. It is here, now. We are bringing it into being. And we are doing so by leaving nothing out of our vision: we encourage cultural awareness and achievement, a reevaluation and reinvention of civil society according to harmonious principles, and full appreciation of the absolute priority of the well-being of all life and the intrinsic principle of development. We leave nothing out! Scientific achievement, economic fairness, social harmony, cultural vitality and physical health: nothing essential to the fulfillment of life can be omitted from a true understanding of Shambhala. And no one must be left behind. I returned to Ulanbaatar on 24 May with a great sense of relief. New York was shaking off its bitter winter and it had been a productive few weeks for me intellectually. The 80th Anniversary celebration of the Roerich Pact at the UN was exciting and provided important opportunities to reconnect with my Russian colleagues. The most important thing I took away from that experience was the confirmation that culture is more important than ever. So, feeling renewed in my sense of purpose, it was with high hopes and impatient enthusiasm that I made my trek back to Mongolia where I would pick up my work with the Roerich-Bira Foundation. It is said that there are three ways to create new wealth: banking, agriculture and mining. Each of these has been corrupted by their perverted forms in the course of the past few decades: over-financialization, GMOS and environmental destruction. I assert that the fourth way to create new wealth is through culture. Aristocrats in centuries past used to diversify their wealth thusly: one-third gold, one-third land and one-third art! Indeed, there is no denying the wealth potential represented by culture. But its value extends beyond the monetary to include the deeper psychological dimensions. I have long felt that culture gives the collective the same essential benefits as sleep does to the individual. It has been shown that sleep deprivation–more specifically, the deprivation of deep sleep, where dreams occur– inevitably leads to psychotic symptoms. Without dreams, the psyche begins to dissociate, to break down. Inevitably, death will result. I believe it is the same with culture. Culture is the dreaming process of the collective. It allows reflection, respite, metaphorical representation, illumination and the integration of experience. Thus, attacks on true culture by propaganda, mass disinformation and heartless media (that glorify violence, objectification and mindless obedience) are attacks on the health of society and, by extension, the lives of every individual. The creation of false culture is part of the effort to replace true culture. But also the wanton destruction of true culture is also in evidence: the recent assault by “ISIS” on Palmyra represents an assault on culture on a truly metahistorical scale. Even the agents of destruction themselves, “ISIS”, are artiticial. They are hardly Islamic and are indeed the creations of Western intelligence and Mossad. The attack on Palmyra is only another example of the fascist effort to destroy the natural heritage of the human species in order to replace it with a system of control. Even to say “fascist” is a bit inexact and even primitive. More precisely, it is probably true that we are witnessing a Freemasonic project to seize utterly the dreams of the human race and to disempower with empty spectacle that bears unmistakably psychotic aspects. In short, Goldman Sachs, Monsanto and Ivanhoe Mines have been joined by the very artifical ISIS who indeed are corporatist dream killers. Together, their aim is to deprive the human race of free access to its sacred birthright–natural wealth. Summer has come to Ulaanbaatar. The mild heat and dry air is soothing after the long winter and a changeable spring. It feels good to be back the Roerich Museum, working hard. A few days following my return, we had a stupa renovation ceremony, led by a remarkable lama, a Rinpoche. He is a very young man of sixteen, but his dignity and palpable benevolence conform his calling and his abilities. Dandar Lhaaran Rinpoche presided over our renovation and pledged to return and to guide our subsequent work. He is a committed Shambhala agent and his kindness and encouragement has already brought the Roerich-Bira Foundation many remarkable and unexpected blessings. Dr. Bira and I have agreed to collaborate on a writing project which will posit Shambhala as the antidote to the encroaching control measures being desperately imposed by a clique that seems to have lost its direction and whose increasingly violent means threatens the survival of the planet. We work joyously, without hesitation, without hatred. We invite full participation. The summer will be full of exciting discoveries. The international symposium that we had planned for June needed to be postponed until October. We were not too dismayed. We believe there is a reason for everything and we believe in our ultimate success. We are planning a cultural event at the museum on 4 July. I look forward to reporting on what promising to be a richly rewarding afternoon! Please keep following us. Many thanks and blessings. There was a wonderful event at the UN last month. It was the 80th Anniversary of the Roerich Pact. It was a pleasant, breezy day but still with the edge of unseasonable cold that had haunted the northeast all through the winter. The day was bright. I found my friends from the Moscow Roerich Museum standing just outside the security entrance. Col. Stetsenko greeted me warmly. He has a wonderful way about him: matter-of-fact, coolly in command and with a lively intellectual curiosity. He had given me his card after the 2013 Roerich Conference in Moscow and asked me to keep him informed as to our progress in Mongolia. I was very happy to see him now in New York and to be able to report on many positive developments. After passing through security and finding my way to the exhibit hall, I was very pleased to see my Bulgarian colleague Marga Koutsarova. She is a very bright spirit of great intelligence with a deep and lively devotion to truth and culture. We had spoken at length in Moscow about Mongolia. And now we had a couple of hours time to catch up and to share ideas on world events, Buddhism, history. After greeting one another, I noticed a display featuring a large photograph of Franklin Roosevelt. I nodded to it and said, “What we need is another president like FDR.” Marga laughed, saying, “I was thinking the same thing!” And on that harmonic convergence of thought, we began to explore the expansive topics which occupy most of our waking thoughts. If anyone will know how to reach the stars without destroying the Earth, it is the Mongolians. And this tremendous innate talent lies in the awareness of Shambhala, in the nomadic ways and in a Mongolian philosophy which emphasizes triadic rather than dualistic thinking. There is a tremendous wealth of knowledge which is yet untapped and untasted by the world at large. I want to help communicate this treasure to the world. For Mongolians, Shambhala is not merely a feel-good concept. It demands study and active reflection. Shambhala is a living phenomenon and directs the efforts of active dreamers like myself. Shambhala has whispered to me, even in my ignorance, only very recently. It has invited me to contribute something. I am happy to do so. I am doing what I can, as it occurs to me. With each step, more is revealed. It is not an indulgence in secret teachings. It is here and now. No special knowledge is needed at first. Knowledge comes through the gradual fulfillment of purpose, through action. It was very exciting to attend the 80th Anniversary event. The late afternoon sun illuminated the hall as Russian Ambassador Anatoly Churkin made his introductory remarks. It was a pity that no US representative attended. It was quite embarrassing for me, actually. The present geopolitical outlook of our US government is shutting out a great many intelligent and progressive possibilities. This bitter reality irked me and made me long for some sudden and dramatic awakening. But for the moment, I was able to relish the feeling of peace. As with everything to do with Roerich, one could feel a strong element of magic at the event. This magic has less to do with hidden knowledge than it does with the growing awareness that a new era is upon us–the Epoch of the Heart–and that we need only exercise courage, discernment and compassion . . . and allow ourselves to be guided by higher sensibilities. Shambhala becomes real when we listen, when we share in truth, when we work for peace. It is no vain dream, but a thing which is unfolding unstoppably! When one works according to Universal Law, the great and primordial powers are happy to aid. But it is we who must initiate and drive the process. We live in a difficult and glorious time. It is glorious because we embrace the difficulties. And it is difficult because we respect what is glorious. The momentary sense of calm and satisfaction that I felt at this UN event was balanced by the lingering aches of recent struggles as well as the sobering awareness of all that is left to do. It was an event that I will certainly always remember. I was enriched by the conversation with friends, the experience of hearing Ambassador Churkin’s address and shaking his hand, and by the glowing sense of vindication which crept over me as stood there at the UN wearing a badge that identified me as representing Mongolia. It was a kind of ideal day for your average Shambhala agent. I was excited to get back to Ulaanbaatar and report to Dr. Bira. Must in outer darkness hover. His linking of Dr. Bira and this passage from Goethe underscores a crucial reality: the Human Being requires a psychological orientation that can comprise the full accounting of his identity. In this great accounting, the soul is confirmed and substantiated. And robbed of historical legacy, the soul falls into peril and must be rescued by the servants of the Infinite, the visionary historians. Those who, like Dr. Bira, have shouldered this task deserve to be honored in our daily actions, which increase in dignity and compassion as a result of the awareness that they awaken. It is interesting to note that in Goethe’s time, history was regarded in the West as a tale that indeed could be told within the mental parameters of 3000 years. Now, collective self-knowledge has expanded considerably. Now, we take for granted an historical awareness that comprises a much greater span. The majestic pan-Mongolian region reverberates with the powerful energies accumulated over a span of time which, while subject to scientific revisions, invites us to consider a history of unprecedented depth. It is said that the Buddha Tonpa Shenrap Miwoche left his native Shambhala to share knowledge with the outside world, founding the Zhangzhung Civilization and the Bon religion, the precursor of modern Buddhism. It is said that this took place some 18,000 years ago. I am not sure if anyone can say with certainty the exact age of Shambhala itself, nevertheless, it persists as the region’s most formidable historical reference and recollection, as well as its most powerful “projection”. Its historical reality confirms the living principles that will recreate an era of peace. Shambhala was and will be. And serious Shambhala researchers have the intuitive power to understand that their work unravels and confirms ancient realities even as it promotes an actualization of the eternal truths that are revealed in the process. The world cries out for Shambhala. We strive to reconnect with cosmic truths in an effort to overcome the lethal divisions that exist between us and our natural world, and even within ourselves. We seek a clarity and a path that will lead us back to original source of wisdom. Human forgeries, in the form of ideologies, have been used to consolidate psychological control of populations. Those already awakening to Shambhala consciousness are increasingly able to spot these forgeries, these destructive unrealities that have been imposed on the collective consciousness by the agents of oligarchy. The way to conceptualize Shambhala is to imagine the ability to detect living truths behind the screens of untruths and then to reach through the screen of falsehood and take hold of the living cosmic reality. When one makes a practice of this, the result will be Shambhala–a constantly developing state of goodwill and the alignment of fortunes. Shambhala is the natural result of the lively adherence to cosmic truths which do not vary but are nevertheless infinitely flexible. And so, whoever we are, we can feel the immediate empowerment to do the right thing. And so, the study of Shambhala eventually brings about its realization: a truly pro-human society! Shambhala is the living, factual manifestation of the Divine principle of development. Our every thought, wish, desire, instinct, breath and understanding develops. In our inward lives, we sometimes strive toward and sometimes resist develoment. But there is no denying that it is a fundamental force inherent in creation. And, just as we must strive for harmony, we must indeed honor this natural principle, to expand our understanding and insight. This is true in our inner lives, our relations with one another and in our social context. It is nowhere untrue. We strive to know more and live more feelingly. In this way, we promulgate a spirit of holistic development. In our awareness of environmental considerations, our respect for the feelings of one another and our humble wish to make the most of creation’s gifts, we cannot fail to develop in extraordinary ways. It is a future we needn’t fear. We must, in fact, resist the propaganda of fear as we spiritually, and in every way, prepare for the future. Achieving balance between Earth and Sky, the Human Being progresses joyfully, energized by gratitude and the desire to contribute. What do I currently understand about Shambhala? That it is about tuning with one another. When we become attuned to our environment and most especially with ourselves and other human beings we resonate with powerful cosmic truths. The harmonies we create are also powerful: when tune to one another, as is the practice in a good choir, the energy we create is vibrationally superior, more engaging, with a greatly enhanced power of projection. A well-tuned choir can fill an enormous chasm with very soft singing because the well-tuned intervals create a host of overtones that then carry the sound almost effortlessly. The overtones produced by well-tuned musical intervals have sometimes been referred to as “visitors” because these are tones that seem to appear out of nowhere: there is no voice in the choir that sings the ghostly note you can hear quite distinctly, yet this overtone is the mathematically predictable phenomenon inherent in all matter in the Universe. These visitors enchant, aid, mystify and ultimately enthrall, but they are absolute emanations of an intelligent universe that have strict mathematical value. Perhaps this is the source of their enchantment: they remind us of cosmic reality, they connect to us something so fundamental that it creates the sense of a ghostly encounter. All good singers create the beauty of their sound through the cultivation of attractive overtones within the single voice. Bringing this awareness to the choral setting allows for some rather stunning musical experiences. It is not a matter of opinion. It is a matter of fact. Well-tuned intervals generate cosmic truths and move us on a cellular level. So it is with Shambhala. People argue uselessly about whether Shambhala has physical reality or whether it is a state of mind or a myth like the Holy Grail. I believe that it is all of these in a resoundingly emphatic and absolute way. Reality itself is all of these! And Shambhala can only happen in reality! People need food, medicine, education, a free and uncoercive civic life. Every aspect of life is sacred, together with the sacred principle of development. Shambhala clears away obfuscation and does do joyously! Shambhala resolves the tensions between the individual and the collective. It does so, through ceaseless and attentive tuning, joyous vigiliance. A good choir consists of very thoughtful asked interesting people. They must organize themselves internally to able to produce the results described above. Therefore, the physical manifestation of a mathematically predictable event–the blissful experience of hearing well-tuned choral music–begins in the inner psychic realm of each singer. So it is with Shambhala. Once created, the physical overtones–the visitors–exist as reality. Similarly, when we become attuned to one another in society, Shambhala exists and is verifiable by direct experience. This is the message that the original and current keepers of Shambhala wish to impart. We can exercise the prerogative at any moment to bring ourselves more in tune with one another and with cosmic truths, which are ultimately one. The effect we produce will be measurably more powerful, more meaningful and more effective. And it will seem to be achieved with less effort. On a personal level, this state is analogous to “being in flow”. On the level of society, this is Shambhala. It is always a measurable objective reality in which compassionate beings react and create in harmony with one another and with cosmic principles! That is, when Shambhala is achieved, it manifests startling objective results. It affects every aspect of human existence. There is no aspect that is not transformed by this merging of conceptual dualities. The physical world and the spirit world become one. The physical needs, the intellectual cravings, the cultural manifestations as well as administrative necessities are equally sacred in Shambhala. No aspect of life, and no person, is left out of the equation in Shambhala. And its verifiability is as calculable as that of good musicianship. Indeed, these vibrational intervals resound at every level of being. Shambhala is about harmony with one another and with the principles that gave rise to everything that exists. It will someday be shown that emotions can be described mathematically. Far from being a reduction of life to prosaic terms, it will makes us gasp in astonishment at the beauty of the universe with its creative principles and infinite potential for invention. We must remember that harmony is not a static state. It is not frozen or even pristine. It is always developing at every energetic level! A good singer does not simply hold a note. The note must develop–it has a life, it must express that life! It contributes something and so it has a beginning, a middle and an end! The journey of a single note joins to the melody and ultimately contributes to the entire elaboration of ceaselessly changing and developing elements. And so, development provides this essential directional it from which the sources of harmony draw their personal strength. Shambhala is the verifiable result of cosmic harmony which begins in consciousness and carries into objective reality. And its effect is to unify reality and consciousness in such an way as to give us the experience of unity consciousness. And, in this context, unity consciousness does not refer to the individual practices of isolated individuals, but to the real world, the one that is shared and sustained by all of us. It is this world that is objectively made whole and devoid of delusion and unnecessary suffering. This is Shambhala. It is physically real. It is a state of mind. It has an historical and geographical basis, but its mythic aspect is a map not merely of the past but of all time. Shambhala operates in all things. It can be actualized by listening. By caring. By organizing. By innovating. Good singers do all of these things. And for a meaningful moment, Shambhala is created in sound. This is my current understanding. I am very fortunate to be able to develop this understanding in conjunction with Mongolia’s top Shambhala researchers, experts and spiritual connectors. The rigors ahead are the stuff of discovery. It is usually this way in Mongolia: miracles are always being discovered by challenging obstructions and seeking the path of spirit. One can breathe it in, see it reflected in the eyes of a friend. One cannot doubt Shambhala. Once we connect with it, tune ourselves and allow the development infinite melody, we will, in an sense, be reintroduced to the world. It will be a world thriving and compassionate.